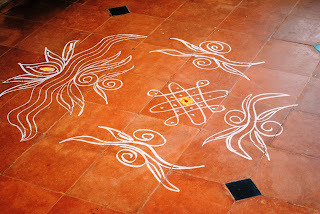 Varalakshmi Vratam is an important pooja performed by many women in the states of Andhra Pradesh and Karnataka and some parts of Tamil Nadu.The Hindu festival going by the name 'Vara Lakshmi Vrata' is celebrated on the last Friday of the bright fortnight in the month of Ashadha, also called Adi, which corresponds to the English months of July-August. 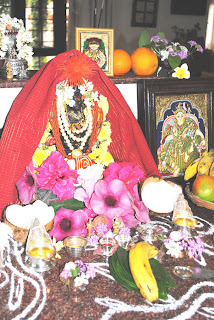 Similar pooja is done by South Indian Iyengars, called Karadaiyan nonbu/ Vrat sometime during the month of March. I am writing about Karadaiyan Nonbu for we are Iyengars. Karadaiyan Nonbu is observed in remembrance of the Satyvan – Savitri legend. A princess, Savitri through her unparalleled devotion saved her husband, Satyvan, from the clutches of death. 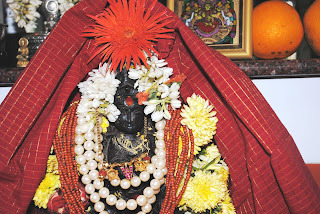 This legend is very popular in India and there are several other observances based on this legend like the Vrat Savitri Puja. On the Vratam day married women fast and break the fast by eating the Karadai preparation with butter. The preparation is known as Karadai nombu adai - the festival takes its name from the unique Kara Adai dish. It is believed that Savitri cooked such a dish and offered it to Lord Yama along with unmelted butter as a sort of thanksgiving for sparing her husband’s life. Another important ritual is the wearing of the Kaaradai nombu saradu, which is a yellow thread, around the neck. "Uruqadha Vennayam oru adayam vaithu nonbu notren oru nallum en kanavar piriyamal iruka vendum" Meaning I partake this prasad and tie the yellow thread, around my neck with the wish that I am never separated from my husband even for a day. Even young girls should wear this thread on that day to get the blessings of God. I must mention, that we end up celebrating the various festivals because of my maid Mary. She is a Christian, married to a Hindu. She is a wonderful person who follows the festivals of both religions with great devotion and enthusiasm. She has lived in the Convent and has been adequately trained by the sisters, and, we feel we are blessed to have her working for us. She is always pleasant, freely going about her work, sometimes bossing us, (which we don't mind), leaving no room for complaint, very trustworthy and honest. People who come to our house also like her very much. We hardly celebrated any festivals, for us all days used to be the same, and even now it is the same, but for her sake we celebrate festivals. 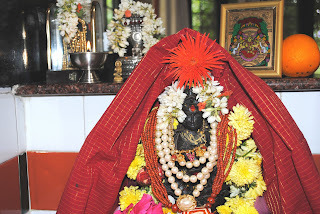 Happy Varalakshmi Pooja to all!! All other images are by Rama Ananth. Thanks for explaining the story behind the Varalakshmi Nonbu. 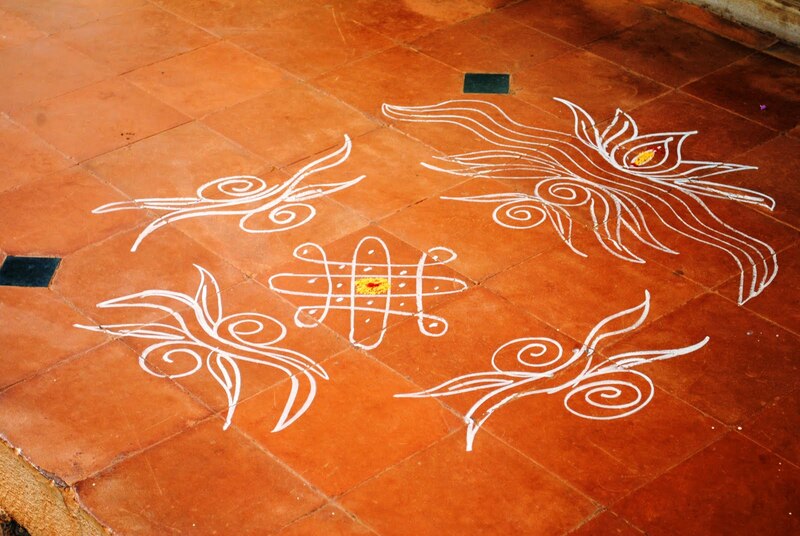 Mary's rangoli is beautiful! 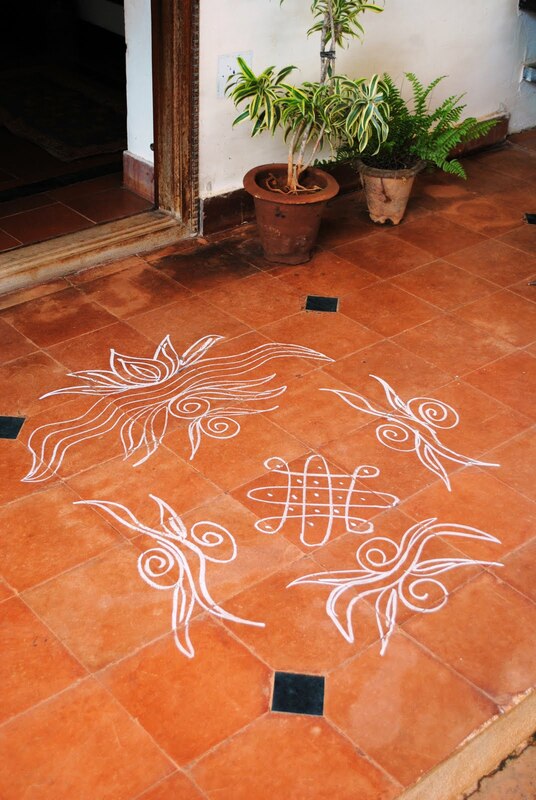 The earthy colour of the tiles makes the rangoli stand out. Thanks Kala. Yes Mary is very good in everything, that is why like her so much. I know that blue sari is very pretty, they have stopped making that kind of sari, so many people wanted to get a sari like that one, and the color is so eye catching. Thank you. Wish you the same Sudha. 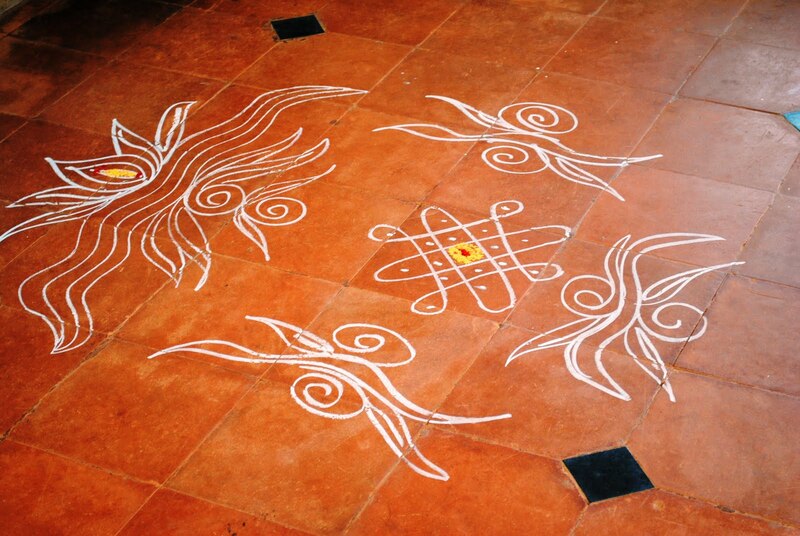 Thanks SV, I agree with you the flooring makes even a simple Rangoli stand out beautifully. Have a nice weekend. 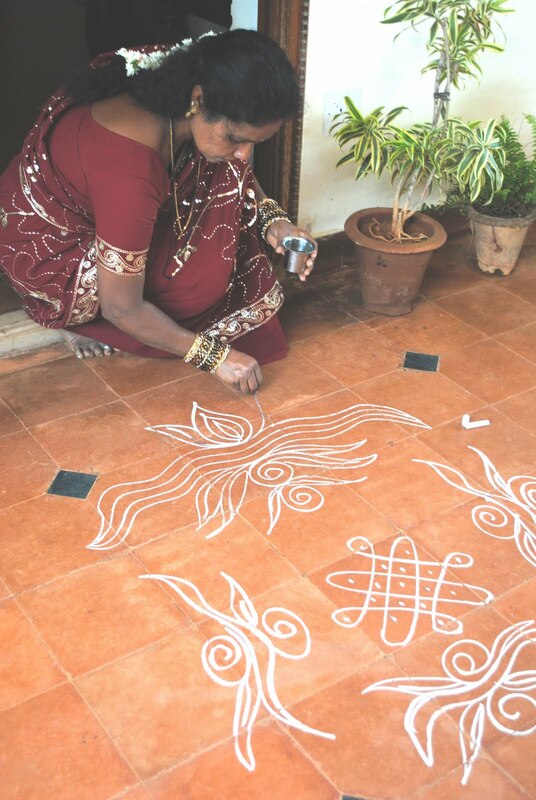 This is so beautiful !Loved knowing about the story of Varalakshmi Nonbu and it's significance.Please tell Mary that her Rangoli is wonderful.She is an efficient and trustworthy person and you are such a loving person.Both of you are lucky to have each other . Lovely photos and excellent write up. So much information packed in one post. I learnt so much about this festival. Rangoli is beautiful..I lived for one and half year in Blore and saw these beautiful rangolies in front of houses. You really took me to your home for the pooja! Thanks for telling about Mary..much can be learned from such personalities. thanks for the info...we too celebrate karadaiyan nonbu.... the rangoli on the terracotta tiles too beautiful.... tell mary about this. First of all thanks for explaining about Varamahalaxmi pooja. 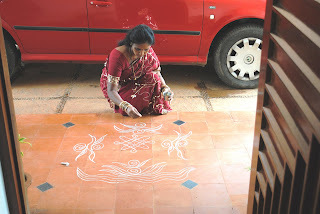 Since I came to live in Bangalore and luckily in our community, we have people from all over India residing. 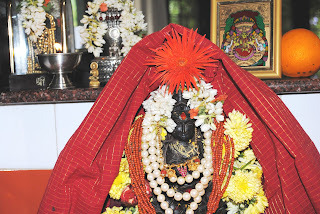 It is fascinating to visit the houses of those who celebrate this pooja, the beautiful way in which they decorate laxmi and wear lovely saris and call us for haldi kumkum. I enjoyed your decoration too though here I see most ladies using a silver laxmi face and decorating it with ornaments and flowers. And, I have a similar maid. She has been working since almost 5 years now. She is a Muslim and one of the most secular people that I have met. She calls me akka and treats me like one. A wonderful lady at heart; I feel as if she is a part of my family. And, I converse with her in my Kannada and she has picked up some Hindi too :). Very good description. Thanks Rama. Thanks Kavita, have told Mary and she is mighty pleased with all the compliments coming her way. 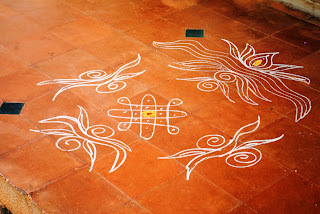 Thanks Joseph, and Nivedita, it is always good we know about the significance of the various festivals, for India is so diverse, with so many cultures and traditions, each region has so many stories to tell. Maybe these days we don't follow many things, still it is nice to know about their origins. Thank you, Ramesh, Nayana, Padmaja, Asha, Rachna and Amrit. hi,this is interesting I want to read more! Thanks Nasreen Basu. Welcome to my blogs. I am glad you liked the topics I write on. Keep coming, it is always a pleasure having readers like you.